For my last day in London I planned to visit a Fulham match at the famous Craven Cottage. 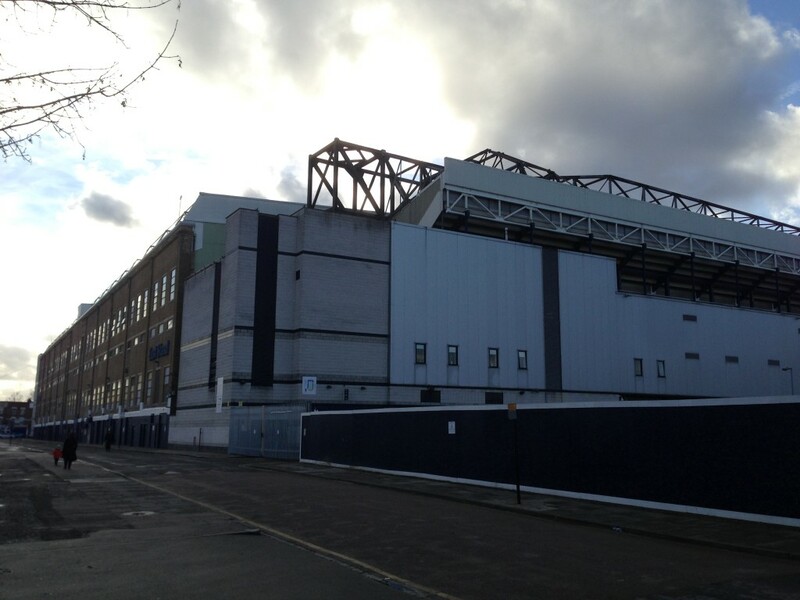 I also took a look at White Hart Lane during the day. The Fulham match was at 19:45, I still woke up early. An american girl caused some commotion while looking desperately for her passport. I tried to help her, to get a little more sleep. She was going through her stuff for several times and started to panic. After a while I gave up and went to the showers. Guess what I found in there? You’re right, her purse with the passport. I went to the lobby to hang around and grind the instagram and twittergame for a while. Soon I parted for White Hart Lane. The stadium has no underground station in walking distance. The easiest way is taking a bus from Seven Sisters. From the outside White Hart Lane does not appear like a stadium. The security at the entrance strengthens the assumption, you are standing in front of a factory. It is a a big box-shaped building, with four similar high sides. The outside is completely closed, leaving no possibility to catch sight of the field. A couple of pubs are in front of the stadium. The stadium itself is pretty rundown, that’s why the club announced plans for a complete reconstruction. This will probably result in a loss of the typical english stadium felling and a tear down of the pubs. I walked around three quartes of the stadium. Parts are already fenced for the areal construction. After using the restroom and having a pint in one of the pubs I went back to the hostel, charged up my oyster card and took the underground to Putney Bridge. From there, it is a ten minute walk to Craven Cottage, which I reached fairly early. There were still plenty of tickets available, even though it was the only fixture in the 9 million metropole today. It was possible to sit next to the famous cottage, the reason for the name of the stadium. My german friends were sitting at Hammersmith End, so I bought a ticket exactly one row in front of them. Afterwards I took a short look inside the fan store. The kits were on sale and I asked the assistant, if it is because the team is performing so poor. He did not respond. Then I walked around the stadium. Again a complete circle was not possible. This time, because of the river Thames. It tides directly behind the main stand. From the outside, Craven Cottage looks less spectacular than expected. The old bricks create a nice appearance though and the visible cottage pavilion is worth a glance or two. After walking around the stadium, I went to a pub called „Crabtree“. The pub is located directly at the river, about ten minutes in the opposite direction of Putney Bridge. It has been a recommendation, I did not regret, although the pub is basically the opposite to yesterday’s Boleyn pub. It has that kind of atmosphere, that makes you want to buy a wine. Flo and Roman called. They wanted to have a drink somewhere closer to Putney Bridge, but due to a lack of opportunities they came to „Crabtree“ as well. Shortly after seven pm we started walking to the stadium. I really enjoyed the possibility of having a drink or meal and entering the stadium quickly, even close before kick off. We sat unusually close to the pitch, so we joked about getting hit by a ball. Unbelievably it did happen. A cross from the right wing was blocked other fans blocked to ball and Flo managed to catch it. He threw the ball back quickly. Then it came to our minds. We just missed the opportunity to take a selfie and annoy more than 15,000 spectators. In England there is only one match ball, so it would have taken some time to resume the match. Even the ball-boys only return this ball. A new one is only brought onto the field when inevitable. Presumably this is a reason why extra time in England is usually a bit longer. Before kick off fulham fans enrolled a flag across the stand. With that came a minute of applause for recently passed Jimmy Hill, a club legend. The match itself was thrilling. Fulham scored an early lead, but Rotherham was stronger and equalized quickly. Right before the break Fulham was able to gain the lead again, after converting a cross. We tried to buy a pie during half time, but they were already sold out, when we finally reached the kiosk. Getting a beer was pointless too, because the match had continued by then. Some english friends of alcohol consumption were standing still outside the stand. When passing them, they shouted „New hat, new hat!“ I was confused. Another fan explained, they play a game, where they try to spot new christmas presents. In this case, that was a bingo. 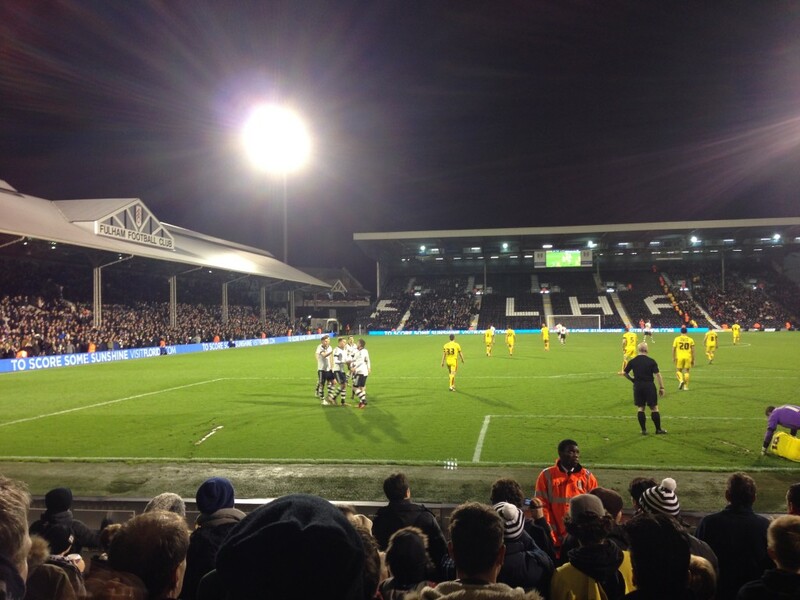 Fifteen minutes in the second half, Fulham scored the third goal. Ten minutes later the agile McCormack was able to close the deal. He stopped a header, turned around and shot from inside the box. The goalkeeper was without a chance. On the field McCormack played a similar style as Rooney. The program revealed his cogitation is probably similar too. If he had not made it as a professional football player, he would likely be living the Rooney live from the Nike commercial before 2010 world cup. The one, where Rooney does not score. All in all Fulham had the superior chances, but the result was a little too high. We went to the „Crabtree“ again, to have our last pints. This was a sweet ending to an even better trip. When it comes to stadium and match, the saying: „The best comes last.“, definitely came true. Résumé: London for Boxing Week is absolutely worth a visit. No matter if watching football or darts, you will meet a lot of groundhoppers from all over Europe. Two match days within a few days result in the opportunity to watch a match at whatever ground you prefer. If there is a day without football, you can do some sightseeing, look at grounds or watch darts at the Ally Pally. Tickets for Premiere League should be booked in advance, lower tier tickets will most certain be available on match day. I paid 85£ (115€) for three fixtures (West Ham 50£, Fulham 25£, Millwall 10£), which was a good price. When ordering tickets via third party companies, this amount is easily charged for one match. If you want Arsenal, Chelsea or other high class opponents, you will most likely need to buy at those resellers. Also take into account that sights, pubs, restaurants and most important the public transport might be closed or have limited opening hours, due to public holidays. The underground closes earlier than usual. If interested, feel free to take a look at part one and part two.